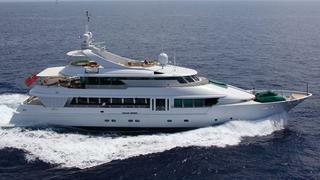 Burgess reports that it represented the seller in the sale of the 40m motor yacht AquaLibrium. AquaLibrium was built by CRN in 1994 for a seasoned yacht owner. Walter Franchini designed her exterior and voluminous interior, whose decor features marble, alabaster and curved Italian wood panelling. Large windows offer lots of natural light and spectacular ocean views. Accommodation is for 10 guests in five cabins, including a main-deck master cabin with his-and-hers bathrooms and walk-in wardrobes, and four lower deck guest cabins – a full-beam VIP, a double and two twins, all en-suite. A great yacht for entertaining, AquaLibrium has a main saloon with a flexible layout and formal dining for 10 guests, plus a shaded aft deck for al fresco dining, another dining saloon on the upper deck, a spacious sun deck and an easily accessible swim platform with an array of water toys. AquaLibrium was asking $6.95 million.